After several years in development, Dave Forrest finally presents his ULTIMATE finale for the 'Ambitious Card' routine! This ingenious gimmick will allow you to cause a freely selected, signed card to suddenly appear on top of the deck despite the cards being locked inside the card case! AND, the arrival of the card is physically witnessed by the spectators through a large hole that is cut in the box! The case is then opened and THE SPECTATOR REMOVES THE SIGNED CARD. The deck is removed and THE BOX CAN BE EXAMINED. Finally, THE DECK IS HANDED OUT FOR EXAMINATION, too. There is NOTHING to find. 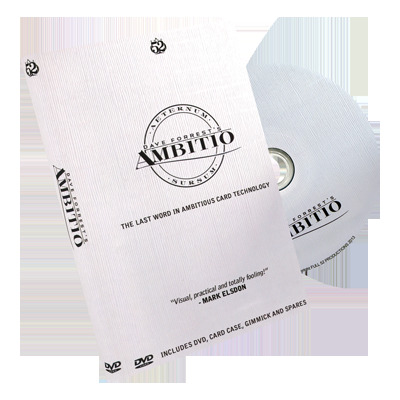 This is Dave Forrest's 'AMBITIO'. A simple colour changing deck effect using the Ambitio gimmick! This effect is CRAZY and makes use of a very cool variant of the Ambitio gimmick! An INSANELY COOL idea with the Ambitio gimmick - a whole routine with a KILLER ending! Includes precision, handmade 'Ambitio gimmick' + pre-cut, bicycle card case. Everything you need to get going straight out of the box! Full explanation of the gimmick, the set-up and several handlings including the super-easy clean up that allows them to EXAMINE EVERYTHING!